Home » Chewy » Jujyfruits – Old School Stickiness = Ickiness? Jujyfruits – Old School Stickiness = Ickiness? Hey there, readers! We took a week off to let the Milky Way Simply Caramel contest draw out a little longer. There’s a lot going for Jujyfruits. First, they’re about as classic as it gets for a 70’s kid such as myself. Second, they’re cheap. I got this box for 39 cents. Sure, they were on sale at Cost Plus, but…they’re not an expensive candy. Third, they don’t pull the lame-o modern maneuver of putting the actual candy inside a much smaller plastic bag and THEN putting that bag in the box. No, this is one of those WSIWYG things- a big, spanking box full of Jujyfruits. Lots of them come in a box. Lots. So far so good, right? Now we get to the problem areas. The flavors are…decent. You get raspberry, lemon, lime, orange, and….. black licorice. Huh? Kind of odd, as licorice overwhelms all other flavors, but…points for originality! Weird trivia: while these are the 5 flavors you, get the shapes of the candies are pineapple, tomato, grape bundle, asparagus bundle, raspberry, banana and pea pod. Everyone take a moment to mull over that one. Why? What logic was used here? “Kids will LOVE these if only we make them LOOK like veggies! Kids LOVE veggies, so we’ll trick them into eating this candy by DISGUISING them as veggies! ” Genius. But actually…it is kind of genius, and so weird and out there that I have to give them points for it. Things that make no sense appeal to me. The big problem with Jujyfruits is the toothstick. 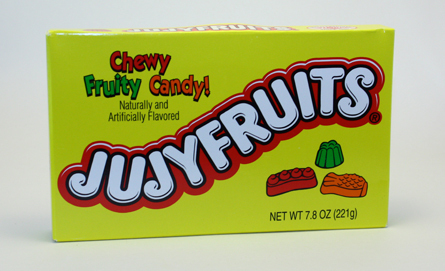 For those that don’t like sticky gummies, Jujyfruits are more or less Satan’s spawn. Cause they stick like a mother. They’re relentless. 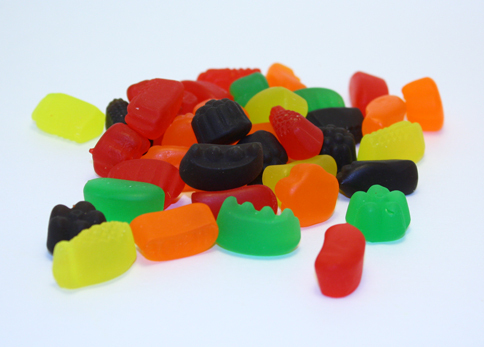 I’d include a photo of them hiding in my molars, but that would be gross, and here at Candygurus, we don’t “do” gross. We do immature, stupid, snarky, silly, annoying, repetitive, and surly, but not gross. The toothstick factor kills these for most people. But if you DO hang in there anyway…you’re still not getting a great payoff. Hey, I call ’em like I see ’em, folks, and this one has mediocre written all over it. However, they bring back fond memories for me, which is kind of what candy is all about. I’m gonna leave it with this-don’t make a fruit mix of candy and then “throw in” licorice flavor. It doesn’t work for me, and I LOVE licorice. It’s not about that. It’s about clashing flavors, and ultimately, Jujyfruits aint nearly tasty enough to make up for the clash of the titans sticking to my molars. Agreed. Leave these out of the shopping cart. A 2!? No fkn way.